Fury Comic books from Dell Publishing. "Sargent Preston" a Canadian montie, called his horse Fury. There are comic books and movies made about Sgt. Preston and Fury. "Black Fury" by Charlton Publishing. 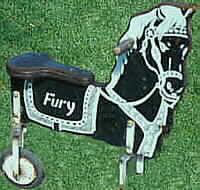 The comics also had a series of books on a horse called Fury. Davey Crockett also had a horse named Fury. There was a Fury music box. Designed from the Breyer Fury horse mold and inside the body is a music making device. Fury jigsaw puzzles. They originally sold for 29 cents. by Whitman Publishing Co. 1958. Fury trading cards issued by the Maple Leaf Gum Co. of Holland in the 1950's. (Film & Stage Stars) . The cards were inserted in chewing gum packs. The backs had the actor's name, and the card number. Fury, and the cast appeared in cartoon like color photos. A Fury game copyright 1959 Television Programs of America, Inc. Bronco Busters! Race with your pals on Fury's Ranch. Horse race game with an attached spinner and cut out game pieces. and given to the fans of the show. Mostly 8" by 10" and 5" by 7" sizes. 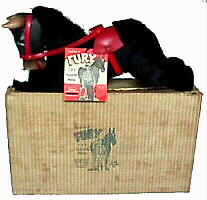 "Fury The Horse" suffed animal figure - 14 inches long, complete with red saddle and bridle, tag attached showing Fury and Joey. It was made by Smile Novelty Toy Company of Brooklyn, New York. Vision Productions, Inc. The box and the tag both proclaim Fury as "TV's Favorite Horse". A toy for younger children - The Fury wheel horse. Kids could rear-up and scoot this horse around the yard. There was a place in Santa Clarita Valley of California in the canyon. The wild animal park called Africa USA. It was located in the river bed of the canyon. This was the compound where the Heifers property kept the jungle animals of the Daktari TV series. In fact it was filmed there. Remember the cross-eye lion named Clarence? I saw Clarence in the down town Newhall Christmas parade back in the 1960's when the weekly show aired. Africa USA is gone now. A book by Toni Helfer called "The Gentle Jungle" tells of a horse trade concerning an old black stallion they called "King". He was weak and they nursed him back to better health. They discovered he was well trained and did tricks. No one knew the back ground of this horse until a stuntman came by the ranch and identified him as Fury. I also bought the movie "Giant" just to see Fury. I saw that movie in 1956. I didn't know that was Fury. The movie was good until that woman rode him and used spurs on him. He ended up throwing her off, she died. And Fury had a broken bone in his leg and they had to put him down. Made me so sad even if it is pretend. Fury has 2 white hind feet Fury's name in "Giant" was "War Winds". Fury was an American Registered Saddlebred the was 15 hand high and kept weight at 1000 pound. FURY was a purebred American Saddlebred. FURY died in 1973, according to info published in the book "Animal Superstars" by John Javna.